On May 20th, the Syrian Free Press bannered «Erdogan seems to be out of control: is Turkey on the brink of military coup? ~ Turkey shelling Nusaybin, using bulldozers inside Syrian territory». Since Turkey is now a dictatorship, in which no independent journalists are any longer permitted and the best of them are in prison and being charged with ‘treason’, the most reliable reporting about Turkey is coming from outside. According to this Syrian report, «the situation in Turkey keeps getting worse. Private debt is out of control, the tourism sector is in free-fall and the decline in the currency has impacted every citizen’s buying power. Because of increasing pressures on the central bank and political storms, Turkey’s annual growth rate has already slowed. Turkish people have a very simple choice: either to replace insanity with intelligence and wisdom on the way to peace and prosperity, or continue on the present downward course under the smoldering ashes of civil war and destruction». Without Erdogan in power for Turkey to serve as the transit route into Syria for jihadists and American weapons for those ‘rebels’ (financed largely by the Sauds and the Thanis,) as well as by Turkey’s sale of Syrian oil stolen by ISIS), there’s little hope to oust Assad. Under Erdogan, Turkey has largely led the efforts to overthrow Assad. The former CIA officer, now turncoat against the US regime, Philip Giraldi, headlined in The American Conservative magazine, back on 19 December 2011, «NATO vs. Syria», reporting that «NATO is already clandestinely engaged in the Syrian conflict, with Turkey taking the lead as US proxy. Ankara’s foreign minister, Ahmet Davitoglu, has openly admitted that his country is prepared to invade as soon as there is agreement among the Western allies to do so. The intervention would be based on humanitarian principles, to defend the civilian population based on the «responsibility to protect» doctrine that was invoked to justify Libya. … Unmarked NATO warplanes are arriving at Turkish military bases close to Iskenderum on the Syrian border, delivering weapons from the late Muammar Gaddafi’s arsenals as well as volunteers from the Libyan Transitional National Council… CIA analysts are skeptical regarding the march to war. The frequently cited United Nations report that more than 3,500 civilians have been killed by Assad’s soldiers is based largely on rebel sources and is uncorroborated». On 20 April 2013, Reuters reported that, «The EU said this week it wants to allow Syria's opposition to sell crude in an effort to tilt the balance of power towards the rebels». That oil is sold via Turkey (by Erdogan’s son and his friends); so, fellow NATO-member Turkey is essential to the US-EU-Saud-Thani effort (and some very-inside people are already getting very rich from it). Two days later, the AP headlined «EU lifts Syria oil embargo to bolster rebels» and reported «Being able to take advantage of the country's oil resources will help the Syrian uprising ‘big time,’ said Osama Kadi, a senior member of the Syrian opposition». No qualms were expressed at this being oil which was stolen from Syria, marketed by Turkey. «The sector was a pillar of Syria's economy until the uprising, with the country producing about 380,000 barrels a day and exports – almost exclusively to Europe – bringing in more than $3 billion in 2010. Oil revenues provided around a quarter of the funds for the national budget». The Syrian people weren’t just being slaughtered; they were being robbed, by the Western alliance. Participants in this effort included the Erdogan regime, the Obama regime, the aristocracies of the EU, Saudi Arabia (the al-Sauds), Qatar (the al-Thanis), UAE, and Kuwait (the al-Sabahs, whose daughter had lied the US into the first US invasion against Saddam Hussein). All of them were allies together, to overthrow Assad, an ally of Russia. As RFK Jr put the matter, in retrospect: «Thanks in large part to Allan Dulles and the CIA, whose foreign policy intrigues were often directly at odds with the stated policies of our nation, the idealistic path outlined in the Atlantic Charter was the road not taken. In 1957, my grandfather, Ambassador Joseph P. Kennedy, sat on a secret committee charged with investigating CIA’s clandestine mischief in the Mid-East. The so called ‘Bruce Lovett Report’, to which he was a signatory, described CIA coup plots in Jordan, Syria, Iran, Iraq and Egypt, all common knowledge on the Arab street, but virtually unknown to the American people who believed, at face value, their government’s denials. The report blamed the CIA for the rampant anti-Americanism that was then mysteriously taking root «in the many countries in the world today». And perhaps it all will remain «virtually unknown to the American people». Using US and Gulf State funding, these groups had turned the peaceful protests against Bashar Assad toward ‘a clear sectarian [Shiite vs Sunni] direction.’ The paper notes that the conflict had become a sectarian civil war supported by Sunni ‘religious and political powers.’ The report paints the Syrian conflict as a global war for control of the region’s resources with ‘the west, Gulf countries and Turkey supporting [Assad’s] opposition, while Russia, China and Iran support the regime’». Certainly, Obama’s extremely bloody coup in Ukraine isn’t known to Americans: the official line, promoted both by the US aristocracy’s government, and by the US aristocracy’s media, is that a ‘democratic revolution’ overthrew the democratically elected President of that country, Viktor Yanukovych, in February 2014. The official line is that this ‘revolution’ arose spontaneously after Yanukovych, on 20 November 2013, had rejected the EU’s offer for Ukraine to join the EU. Not part of the official line is that the US Embassy was already starting by no later than 1 March 2013 to organize the overthrow that occurred in February 2014. Also not part of the official line is that the EU’s membership offer to Ukraine came with a $160 billion price tag, and so was entirely unaffordable. Yanukovych had no real choice but to turn it down. After all, the West needed an excuse to explain the ‘Maidan democracy demonstrations’ that provided a pretext for the overthrow. If one is starting on 1 March 2013 to organize a fascist coup that’s to occur a year later, then one won’t want to provide the victim (Yanukovych and the Ukrainian people) an offer that will be accepted by him. One will need the offer to be rejected, in order to have a ‘justification’ to overthrow the victim. One ‘justification’ was that he was corrupt, but they didn’t mention that all post-Soviet Ukrainian leaders have been corrupt. The other was that Yanukovych had turned down the proposal from ‘the democratic West’. Ukraine is the key in Obama’s plan for four reasons: it’s the main transit-route pipelining Russia’s gas into Europe; it’s also a large country bordering Russia, and thus ideal for placement of American nuclear missiles against Russia; it has (at that time it was on a lease expiring in 2042) Russia’s premier naval base in Sevastopol in Crimea, which, for the US to take, would directly weaken Russia’s defenses; and, most importantly of all, the entire case for sanctions against Russia, and for NATO to be massing troops and weapons on and near Russia’s borders to ‘defend’ NATO against Russia consists of Russia’s ‘aggression’ exhibited in its ‘seizing’ Crimea, and in its helping the residents in the breakaway Donbass far eastern region of Ukraine (where the residents had voted 90% for Yanukovych) to defend themselves against the repeated invasions and bombings coming from the Ukrainian government. Crimea is especially important here, because, though Russia refused to accept Donbass into the Russian Federation, Russia did accept Crimea. 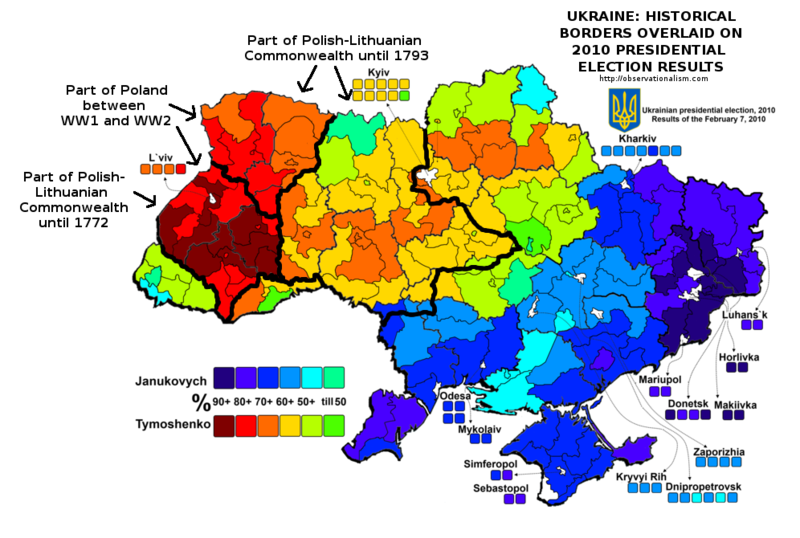 However, the people in Crimea had voted 75% for Yanukovych and had also wanted to become again a part of Russia, ever since the Soviet dictator Nikita Khrushchev in 1954 arbitrarily transferred Crimea from Russia to Ukraine. And therefore Russia – not finding acceptable Obama’s soon-to-be seizure of their naval base – supplied protection for Crimeans to be able to hold a plebiscite on 16 March 2014 in order to exercise their right of self-determination on whether to accept rule by the bloody new Ukrainian coup-regime, or to regain membership (and protection) in the Russian Federation. 97% chose the latter, and Western-sponsored polls in Crimea both before and after the plebiscite showed similarly astronomically high support for rejoining with Russia. But that made no difference in Western countries, because their media never reported these realities but only the official line – as Obama put it: «The days in which conquest of land somehow was a formula for great nation status are [sic] over». Although he was there describing actually himself, he was pretending that it described instead Russia’s President, Vladimir Putin, who was merely protecting Crimeans, and, in the process, protecting all Russians (by retaining its key naval base), from an enemy (Obama) whose gift for deceiving the public might have no equal in all of human history. All of the examples cited here are national leaders who have been friendly to, or even allied with, Russia: Saddam Hussein, Muammar Gaddafi, Bashar al-Assad, Viktor Yanukovych – and, of course, the central target, Vladimir Putin himself – and all of these targets have been demonized in the West, regardless of whether they’re actually more evil than, say, George W Bush and Barack Obama. In the Middle East, things haven’t been going well for Obama’s plans, but, he still retains the example of Crimea as symbolizing a thus-far-successful excuse for economic sanctions against Russia, and, perhaps (and maybe by the next US President), ultimately for an invasion of Russia.